Private information can be inferred from public data. Alphas are found by examining their effective migration strategies. I lay down 5 rules for finding alphas. You only make alpha when you correctly recognize something well ahead of others. When you execute correctly. When you have methodologies that can reliably peer over the horizon. You are not part of the rat-pack. Forget about analysts’ prognostications, they are about betas. Companies are rational group-think. This group-think is substantially governed by their business context. Or companies at least have a system of logic and materials by which they make decisions, which you are not privy to. This is private information. You have access to public information which companies publish to influence your decision-making. That is, there is an asymmetric information between internal staff and outside investors and even between internal staff themselves. How can we peer over the horizon to find the big winners? To make better investment decisions? To do better due diligence? Noting that the purpose of due diligence is to reduce information asymmetry, while GAAP regulations and the Law try to minimize distortions to this information asymmetry. As outsiders, can we penetrate this asymmetric information veil to infer private information from public data? We can. If we understand a company’s logic, we can parse this public information to infer private information, with the goal of sifting through the alphas and the betas. Another example closer to home. You want to buy a car and are at a car dealership. The salesperson’s job is to maximize gross profits, but he does not know what the maximum you are willing to pay. It is his job to get you to pay the highest amount for the car and accessories. The customer, on the other hand, does not know what the lowest price the salesperson will be authorized to sell the car and accessories at. It is in customer’s interest to get the car and accessories at the lowest price possible. These are the two information asymmetries at work here. It was immense fun. Sometimes you win. Sometimes you lose. Disclosure: To get first-hand experiential knowledge of these information asymmetries, I spent 2 years (2016-2018) as a Honda salesperson doing “hand-to-hand combat” (yes, it really is) in Southern California, the most competitive automotive market in the US. It was an experience I am ever so grateful for and will never forget. It was a source of immense personal growth (not what I was expecting) and I would recommend a car sales job at a reputable car dealership for anyone who wants to achieve personal growth. This I will say, the logic of the business, the physical construction of a dealership, is designed to maximize revenue and gross profits. About 20 years ago I finally invented a new class of solutions and coined the term Asymmetric Information Resolution (AIR). This class of solutions was 20 years in development and based on manufacturing business logic. I believe that manufacturing business logic is the foundation for all other business logic. It is based on my background of my first 20 years of work with Texas Instruments (NASDAQ:TXN), Coopers & Lybrand Management Consultants (now PwC), Unilever (NYSE:UL), Westport, and many other companies. In 1995, I was Head of Corporate Planning at Westport, Malaysia, then a $1 billion port infrastructure project, and laid the strategy for it to become the 6th largest container port in the world by 2006. The Port Authority of Singapore (PSA) was its main and only competitor, deriving 35% of its business from Malaysia. That is, PSA was substantially dependent on a single customer, Malaysia. The strategy I implemented was to change Westport’s hinterland definition (and for that matter any port’s) from a 30-mile radius to a 7-hour radius. With that, all of Peninsula Malaysia became Westport’s hinterland and repositioned it from Niche to Scale Economies. With Singapore at the southern tip of Peninsula Malaysia, PSA could not compete as the northern part of Peninsula Malaysia was 18 hours away. That is, Westport now had a physical geographical barrier to its wealth erosion from PSA. My purpose for AIR models was to infer private information from public data to enhance my management consulting services, now Competitive Dynamiques LLC. Since then, for the fun of it, I developed a dating AIR model. A fairly prominent lady emailed me back saying that my description of her was “spot on.” I have not met her but used photographs of her available on the Internet. Okay, a sample size of one is not much to gloat about and I haven’t tested this any further. Consumer advertisers don’t bug me. That is the power of this class of solutions if built correctly. AIR models are the opposite of data mining. Data mining searches through gigantic quantities of data to find a previously unrecognized trend or characteristic. What if that data does not exist? AIR models, on the other hand, state the logical structure of a (business) context and then show what is possible and what is not. These are insight-seeking class of solutions as opposed to a data-seeking class of solutions. Coming back to Henry Miles and his article. Recall Peter Lynch’s due diligence? I would also ask the question, how do you test anecdotal information or observations for validity? The AIR models can. The AIR models I developed to test strategy, operations, etc. and business anecdotal information are the Holistic Business Model, the Financial AIR model and the Competitive AIR model. With these you can peer into companies to see if their public information is consistent with their private information. In this article I will introduce you to the Holistic Business Model (HBM). 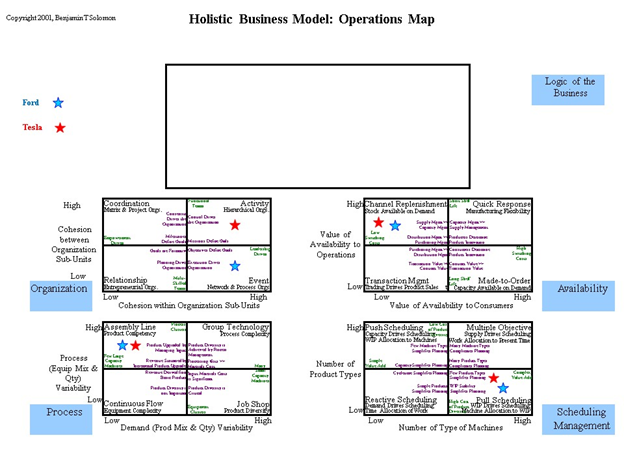 This is an operations and strategy AIR model. The HBM is capable of handling millions of variations in businesses, unlike Porter’s Five Forces model which essentially has a few strategies, Differentiation, Innovation, Niche, Low Cost Producer, Economies of Scale & Scope. The HBM consists of 4 maps, (I) Fig. 1, The Operations Map, (II) Fig. 2, The Revenue Transaction Map, (III) Fig. 3, The Structural Strategy Map, and (IV) Fig. 4, Migration Strategy Map. (III) and (IV) are the same maps but it gets too crowded to put all the information on the same map. As the text in the figures can be too small to read, I have made the (Google Drive) PowerPoint of this HBM AIR model freely available to use either in part or in whole for non-commercial uses, provided my copyright is clearly stated. Each map consists of a box or a framework at the top, and 4 frameworks. The top box/framework summarizes the insight derived from or in conjunction with the analysis of the respective frameworks. For example, in Fig. 1, The Operations Map, it would be a high-level flow chart or network diagram of the business process. In Fig. 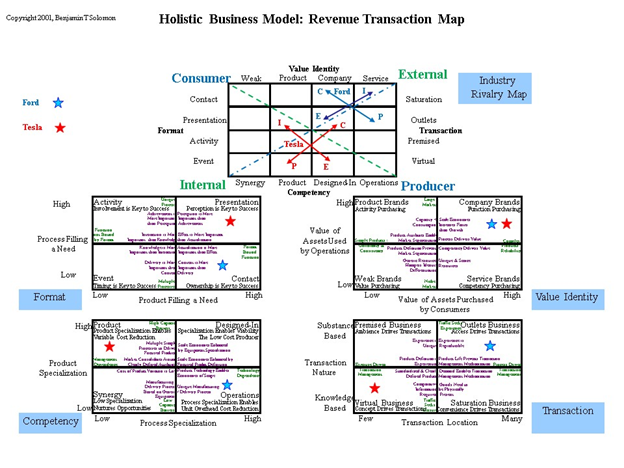 2, The Revenue Transaction Map, this top framework summaries how similar any two companies are and therefore provides an assessment of the intensity of the rivalry between them. In Fig. 3, The Structural Strategy Map, and Fig. 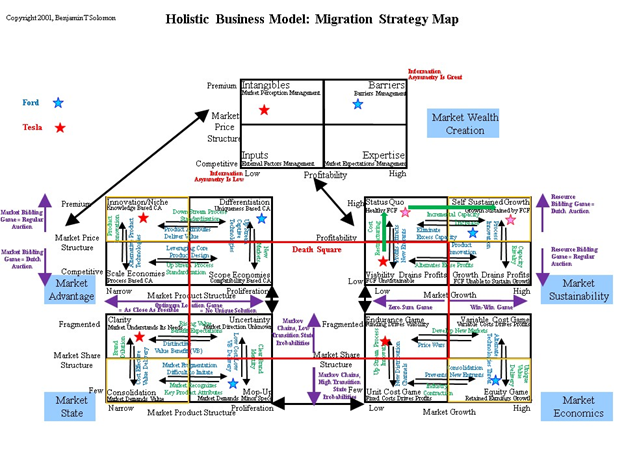 4, Migration Strategy Evaluation Map, the top framework summaries how companies create wealth. Each framework consists of 4 quadrants and each quadrant depicts the outcome of this structure and supporting logic. For example, in Fig. 1, the Organization framework quadrant labels are Coordination, Relationship, Event and Activity, with their logic labels of Matrix & Project Organization, Entrepreneurial Organization, Network & Process Organization, and Hierarchical Organization, respectively. Each quadrant is bound on its inner sides by barriers to entry. For example, Coordination is bound by Consensus Drives the Organization, on the right, and Milestones Define Goals at the bottom. Each framework is constructed from two sets of factors. For example, the Coordination framework’s two factors are Cohesion Between Organization Sub-Units and Cohesion Within Organization Sub-Units. These are the primal factors. The dual factors are depicted within the framework, and in this framework are Functional versus Multi-Skilled Teams, and Empowerment Driven versus Leadership Driven, respectively. For this article, the comparisons between Tesla (NASDAQ:TSLA) and Ford (NYSE:F) are presented here, done using anecdotal news reports without looking at their financial statements. This is to prove that it is possible to infer private information from public anecdotal reports. Beware, however, as your assessment of a situation may be different from others and to sharpen this analysis you should verify and adjust using available financial statements. AIR models are forgiving of uncertainty. When Ford Shuffles Roles for Two Top Executives it is seeking to reposition its top management to a more Event (Organization Framework, Fig. 1) based structure to more quickly respond to changes in the mobility business environment. Therefore, I infer that CEO Jim Hackett has either Hierarchical or Entrepreneurial (Organization Framework, Fig. 1) management's style. (See Fig. 1, blue stars). Having worked in automotive sales I would guess his style is Hierarchical. Automotive industry is Assembly Line (Process Framework, Fig. 1) with Pull Scheduling (Scheduling Management Framework, Fig. 1), unless you are a specialty car maker then, your Process Framework would be Job Shop, and Scheduling Management, Reactive Scheduling. The business’ Availability (Framework) quadrant is Channel Replenishment at the dealership, but it could be Quick Response at manufacturing. Compare this with Tesla’s Made-To-Order (see Fig. 1 red stars) or at least the attempt to. Scheduling Management (Framework) in the semiconductor industry is Multiple Objective at wafer fabs and Push at Assembly-Test. In the late 1980s, I proved that Push and Pull are Primal-Dual problems and therefore give similar if not identical schedules. Therefore, which you use, Push or Pull, is dependent on your business context. In the Format Framework, auto sales (Ford, blue stars) is Contact based as customer ownership is the key driver, as opposed to Involvement, Timing or Perception. Operations (Competency Framework) is key as evidenced by Tesla’s (red stars) recent production problems. Tesla has not mastered its Operations competency and it is still in the Product quadrant of Competency Framework. In the Transaction Framework, Ford is Outlets Based while Tesla is still testing Virtual Business. Tesla needs to migrate to Outlets-based (Transaction Framework) but it can only get there by first migrating to Premised Business as it is not big enough to migrate to Saturation Business. The apparent production delays combined with store closures indicate a Hierarchical Organization (see Fig. 1) that is usually incompatible with Innovation Market Advantage (see Fig. 3). Maybe Elon Musk should step down and be replaced by someone who is a relationship builder. Since Tesla and Ford are not close in the Industry Rivalry Framework (top framework of Fig. 2) there is not much rivalry between the two. Thus, cooperation between the two is possible. I have moved away from Porter’s Five Forces model. The next 2 maps lay out strategy. Note, however, not only can you only move horizontally and vertically as with the previous Maps, but you have to stay in the same columns and rows (column & row restrictions) as the neighboring Frameworks. In this HBM AIR model there are two types of strategies. (I) Structural Strategy (see Fig. 3) depicted by their quadrant labels. And (II) Migration Strategy (see Fig. 4), which is the strategy to repositioning from one Structural Strategy to its neighboring quadrant’s Structural Strategy. When working with the HBM you don’t have to start with the first framework. If you are not sure of all your information, start with what you know. The column & row restriction will show you what is possible and what is not. Note, companies that are occupying all 4 inner quadrants, demarked by the red box, are in their death spirals, and should be avoided unless you are in the turnaround business. These companies need turnaround CEOs and depending on the business context these CEO management styles may fall into any of that in the Organization framework (Fig. 1). 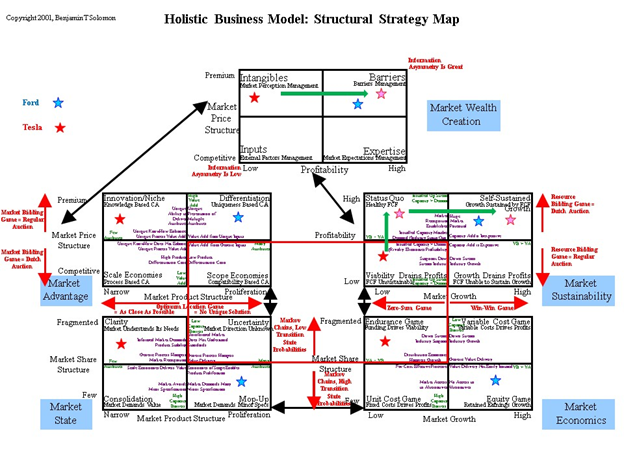 This strategy model recognizes additional market forces, auction behavior (Market & Resource Bidding) in the market, economic game theory (Optimum Location and Win-Win/Zero Sum) and Markov Chains (Transition State Probabilities). Transition State Probabilities inform of repeat buyers. If these forces change, it will force a company’s quadrant changes. That is, external market forces can evict a company from its current quadrant. The top framework, Market Wealth Creation Framework, shows that there are only 4 approaches to creating wealth, Intangibles, Inputs, Expertise and Barriers. Barriers, to preventing wealth erosion, is the ultimate goal of any business. Think, Microsoft and its huge Windows & Office product acceptance. Using HBM, that is an amazing story. Let’s look at Tesla in comparison to Ford. Ford’s Market Advantage (Fig. 3) Structural Strategy is Differentiation as its product structure is wide, SUVs, multiple categories of cars, and trucks; and premium priced compared to Kia and Hyundai. Tesla’s is Innovation/Niche. Tesla has a narrow product range and is premium priced. It has unique know-how to deliver process and product attributes (electric versus gasoline). If you take the view that Tesla is just another car company, then Tesla’s Market State (Fig. 3) is Clarity as it is a small player and comparatively its market looks fragmented. Its customers clearly know what they want (electric, as opposed to non-fossil fuel) or don’t want (gasoline or diesel engines). Ford’s is Mop Up as it is a major market player and offers a range of trims and accessories for each of its many models. Ford’s market growth relative to Tesla’s is higher. Therefore, its Market Economics is Equity Game i.e. building balance sheet equity. It cannot be in the Variable Cost Game as its Market State is Mop Up. Should Ford’s market growth contract, it will shift to Unit Cost Game, and that may cause its Market Sustainability to shift to Status Quo. Further contraction of growth would lead to Viability Drains Profits. Tesla is in the Endurance Game as it is struggling with production problems and cannot realize its revenue potential. It cannot be Unit Cost Game as that is not in the same row as Clarity. However, the introduction of other types of power-trains, such as the fuel-cell (I used to sell the Honda Clarity Fuel Cell) could shake up the market and push Tesla from Clarity to Uncertainty, and Differentiation (Market Advantage) not Innovation/Niche becomes the only Structural Strategy available to Tesla. If you take the view that Tesla is a giant player in the electric vehicle segment of the automotive market, then Tesla’s Market State is Consolidation, and its Market Economics is Unit Cost Game. That is, Tesla has a dire need to get its production up and running without hiccups. That is its first and only priority in the short term. With the successful introduction of alternative power-trains, the market would force Tesla’s Structural Strategy to migrate from Consolidation to Mop Up. Would Tesla be prepared? This scenario is still many years away. Similarly, alternative power-trains could force Ford to Uncertainty, and thus moving it to the Variable Cost Game quadrant of Market Economics. Then it would have to rebuild its brand to get back to Mop Up or migrate to Clarity by clearly defining the value benefits (VB) it is offering. If you think about Tesla is just beginning to migrate from Consolidate (Market State) of the smaller electric-vehicle market segment to Clarity of the much larger auto market, amid prospects who are fed up with the production delays turn to other makers of vehicles, this should show up in the Transition State Probabilities. With either Market Economics, the low profitability, combined with production problems, leaves Tesla’s Market Sustainability in the Viability Drains Profits, while Ford’s higher profitability leaves it in the Self-Sustained Growth quadrant. Ford is unlikely to go to the public markets for funds, but Tesla may. Therefore, Tesla’s Market Wealth Creation is derived from Intangibles, while Ford’s is Barriers. Fig. 3 and Fig. 4 show that Elon Musk’s only option to profitability is Cost Restructuring (Market Sustainability Framework) not cost cutting, to get to Status Quo and then migrate to Self-Sustained Growth. However, Fig.2 shows Tesla’s Format (Framework) is Presentation as public perception has been key to Tesla’s success, but the automotive business is Contact (Format Framework), therefore cutting stores will handicap its revenue growth. In my opinion Tesla will eventually have to move away from its Virtual Business (Transaction Framework) to Outlets (Fig. 2). If Elon Musk does step down, then Tesla is a buy, however, having worked in multinational corporations, I know production problems can and will be solved. Thus, with its share price drop, Tesla is a potential alpha. I have presented a rigorous method to doing due diligence for anecdotal information. This should be accompanied with the corresponding financial analysis. The HBM can be used to compare a company with its competitors, like I have done with Ford and Tesla. From the comparisons you can then determine who a company’s competitors are, that are a threat to its profitability and growth and analyze them similarly. You can also conduct what-if scenarios to determine the impact of a likely threat from over the horizon. Companies in the red box are dead beats but dead beats can become alphas with turnarounds. All other companies are betas. Structural Strategy: Potential alphas are companies that are in the lower half of Market Sustainability Framework that can successfully migrate to the upper half. In addition, good alphas migrate from the lower half of Market Advantage Framework to the upper half. Their wealth creation is then protected by Barriers. Migration Strategy: Therefore, the key to finding alphas is to track the effectiveness of migration strategies of companies that occupy Viability Drains Profits and Growth Drains Profits quadrants (Market Sustainability Framework). If they cannot migrate, they won’t be alphas. Non-Mature Companies: That means that mature companies are unlikely to be alphas. I believe, but have not tested, that alphas provide abnormally high net profits for their total assets. Non-News Worthy Alphas: However, the weakness in using anecdotal reports is that you are only looking for alphas that are in the news. False Alphas: Note, that as this HBM AIR model becomes well-known, management will claim to effect HBM strategies to provide the perception of being an alpha, so make sure your due diligence is better.